•What is driving the emergence of the CDO role? •Is the CDO a short term function and a transition point to something else? •What are the key functions that CDOs are trying to accomplish? •What relationships does the CDO need? •What are the key things that a CDO needs to do to succeed? 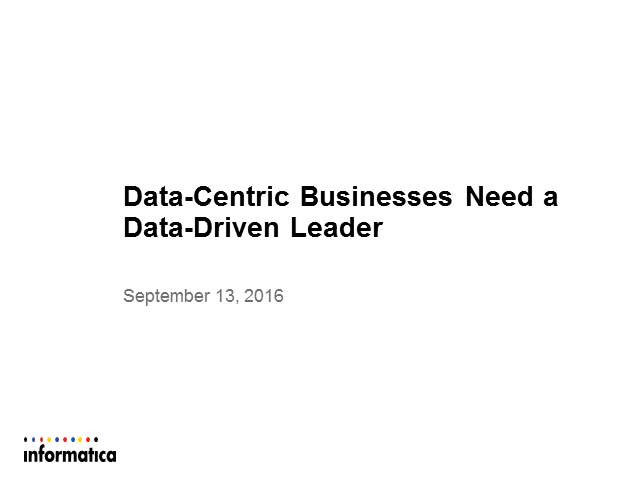 In general, the May 2016 Forrester Consulting study, Data-Centric Business Need a Data-Driven Leader, showed that CDOs are business leaders that have as their goal to build data-driven businesses. This means managing business functions including data governance, data management, data science, and enterprise data strategy. After Forrester shares their CDO research, Informatica will review each of the CDO functions and share how an integrated data platform holistically addresses each function.